Each year, Communications Director Faye Bi attempts to read the requisite 25 books to complete the Sirens Reading Challenge. In 2018, a Reunion year, she’ll be reading books from the past four years’ themes: hauntings, revolutionaries, lovers, and women who work magic. Light spoilers ahead. If you’d like some structure—or company—on your own reading goals, we invite you to read along! The premise of Melissa Bashardoust’s Girls Made of Snow and Glass is stunning: a feminist retelling of Snow White where the queen stepmother and the princess are pitted as rivals, but realize they are more similar than they are different. They eventually recognize each other’s strength and power, and rule the realm together. If someone gave me this elevator pitch, I would ride it all the way up to the penthouse! It’s certainly why I picked this up in the first place. And that is partly the reason why I was so lukewarm towards the actual execution. It feels as if someone had said, “Hey, do you know what would make a really great book?” but then only gave an outline—or fable, perhaps?—instead of a full-length novel. The outline is pretty good: in a cursed land where the snow falls year-round, Mina has married King Nicholas after the beautiful queen dies, now a stepmother to his infant daughter. Though their marriage is loveless, Mina has ambitions of her own, and plans to build a university in the South, where she is from. Lynet grows to be sixteen, the absolute spitting image of her late mother, and seen by everyone—her father the king, the council, etc.—to fill her delicate, dainty shoes in both looks and personality. But here is the twist, and it’s a good one. Mina and Lynet are actually close. Lynet wishes to step outside of her dead mother’s shadow and be her own person; Mina has always wanted that for her, even though her husband the king would rather his daughter copy his dead wife. They have a well-established mother-daughter relationship at the beginning of the novel, even when everyone else expects them to resent each other. More yet, they both share a secret: Mina’s heart is made of glass, fashioned by her magician father Gregory, and Lynet—well, Lynet was created by Mina’s father as well. The former queen did not die after giving birth to Lynet… Lynet is fashioned completely from snow. As a consequence of such magic, both Mina and Lynet have power over their glass and snow respectively, including the power to conjure and shape inanimate objects and animate beings. While the magic is not particularly well fleshed out—Lynet conjures a cloak from snow, but can she create food that’s truly nourishing? Does vanishing something mean it’s destroyed? How do you create organic matter out of thin air? Etc. Etc.—it does have a crucial limitation: life requires blood. Gregory gave his own blood to give Lynet a pulse, so yes, she is a real person and not a hollow body like the Huntsman, and that’s the only indication of magical cost and the crux of the novel’s conflict. But given the misunderstandings galore in this novel, one truly wonders why either Lynet nor Mina didn’t just conjure a bird with a message to fly to the other person and get this Shakespearean drama (including a fake death!) sorted out once and for all. Ultimately, however, my biggest complaint with Girls Made of Snow and Glass is the lack of specificity. The setting, for instance, feels incredibly generic, lacking the details that make Arendelle Arendelle, or Winterfell Winterfell. We know it’s cold, and there’s a curse. Most of the court politics and personality descriptors are told rather than shown, and while they’re relevant to the main plot, they feel like unsatisfying filler. So, the reader must hinge on something else, perhaps the characters? Well, there are only five characters total: Mina, Lynet, the king-who-eventually-dies, Mina’s magician father with his own motives, and the young surgeon, Nadia. Seven if you count the Huntsman and the head Pidgeon/court lady whose name I forget. As such, it feels small. That means that a lot of the novel is focused on the inner lives of these characters and their emotions—is my stepmother planning to kill me? Who could ever love a girl with a glass heart? I was going to sell you out but you changed everything for me!—without any textual examples to sink into and make me actually feel those emotions. 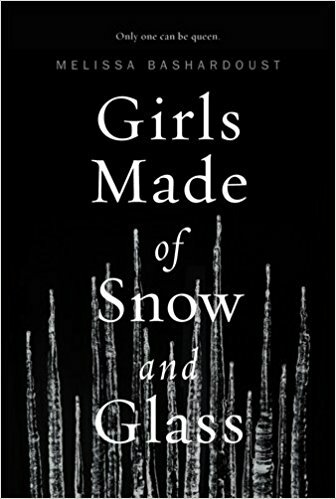 Still, that said, there is plenty to like in Girls Made of Snow and Glass. Bashardoust was successful in pacing two perspectives in different timelines—contemporary Lynet and past Mina—and weaving them together for the last act. The romance between Lynet and Nadia is a lovely idea, but the focus between Lynet and Mina is front and center, as it should be. It reminds me much of Malinda Lo’s Ash, with much of the same strengths and flaws (great, underrepresented premise, yet lack of specificity in setting, characters, and plot). I can only hope that, as Bashardoust’s first novel, her subsequent efforts will be more what I’m looking for in my reading. Next month: A recap of Faye’s 2018 Reading Challenge!